We're hitting the stride with the monsoons and our July 2018 issue is your perfect companion to when you decide to stay in and enjoy the weather. Our cover story also happens to match this mood, being as it is an exclusive first drive of the Mercedes-Benz E-Class All-Terrain. 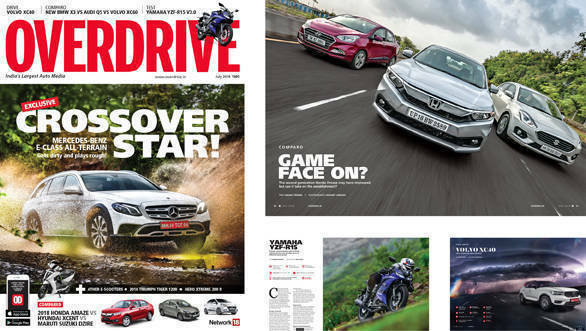 We've some pretty comprehensive comparos this time around with the new BMW X3 and the new Honda Amaze taking on their rivals. The updated Hyundai Creta also takes on the Captur. Like always, we've got some interesting motorcycles for you this time as well. The all-electric Ather scooter is fun and futuristic and we got some time with the newest Yamaha YZF-R15 as well. The TVS RR 310 race-spec we rode on the track was a quite a riot, not to mention the more sedate Hero Xtreme 200R. 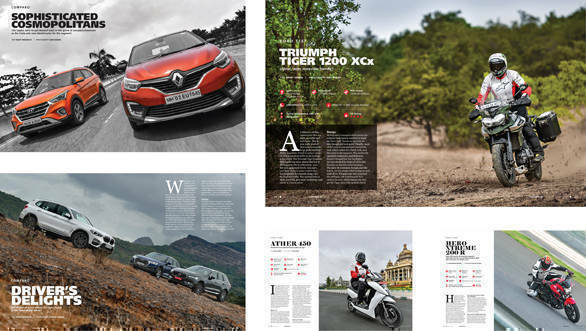 The new Triumph 1200 also found its way here this issue, taking a detour along the not so beaten path obviously. To top things off, we travelled to Mongolia for the 2018 BMW GS Trophy, the only Indian publication to do so. Don't forget to check the spectacular photos we got here. We've got some interesting ideas about the KTM 390 Adventure, to add to the excitement that announcement has caused. Coming back to cars. We've driven an eclectic bunch this time. Starting with quick bursts in the mind-bendingly quick Tesla P100D twins in the Model S and Model X, to the Scandinavian-cool Volvo XC40. We also got behind the wheel of the entertaining Ford Ecosport S, as well as the impressive facelifts of the new Mercedes-Benz C-Class. Special mention to the half-way sportscar that is the C 43. To round things off we delved deep into MG Motor's rich heritage, ending with a drive in their newest sedan offering, the MG 6. This month saw some great motorsport action as well the world over and we were right in the middle of it here as well. The 24 Hours of Le Mans happened this month and we bring you indepth coverage of that this issue, At the completely opposite end, we also tell you everything you need to know about the Formula E race in Berlin. We've also help you keep track of Gaurav Gill's increasingly impressive international expliots on the global WRC arena. Additionally, we've also got you covered with our exceptional editorial pieces. There's enough this month keep to entertained for a good weekend of reading. If you havent subscribed already, do it now here. Get the July 2018 issue of OVERDRIVE now! Get the July 2018 issue of OVERDRIVE now!